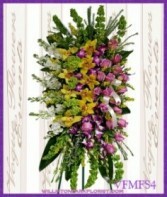 You can send flowers from VOGUE FLOWERS to any funeral home listed below. Please refer to this list for the names, addresses and phone numbers. How do you turn grief into a healing process? Show your respect and sympathy; flower delivery to the funeral home will comfort the bereaved. Although, you can't take away their grief, you can create an atmosphere of support and understanding by sending flowers. Feelings of warmth and caring are created when flowers are delivered to a Williston Park, NY funeral home from VOGUE FLOWERS. To make flower delivery to a Williston Park, NY funeral home easy, call the VOGUE FLOWERS. VOGUE FLOWERS will create a memorial arrangement that expresses your heartfelt sympathy and deliver it to the Williston Park, NY funeral home. Just follow a few Williston Park, NY funeral home flower delivery guidelines. To help you find a Williston Park, NY funeral home, VOGUE FLOWERS lists all the funeral homes they deliver flowers to. A Farewell Offering Funeral Spray to convey your direct sentiments. This modern, elegant, and well balance spray will bring comfort and love at the time they need it most. Call us today, (516) 248-8544 or order online 24/7 Vogue Flowers in Williston Park, NY and we'll be glad to assist you. Note this item can be customized and upgraded to $499.95. Item code VFMFS4. 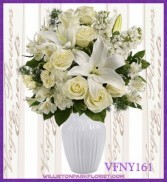 VFNY161-Fondest of times floral arrangement, roses, lilies, alstromeria, and more elegantly arranged by our talented designers. Send this to express your fondest sentiments.Call us today, (516) 248-8544 or order online 24/7 Vogue Flowers in Williston Park, NY and we'll be glad to assist you. Note this item can be customized and upgraded to $149.95. 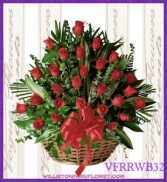 Our Red Roses Basket Arrangement is the perfect way to convey your direct sentiments. This arrangement of All Red Roses will surely be the center of attraction and is suitable for all celebrations. Call us today, (516) 248-8544 or order online 24/7 Vogue Flowers in Williston Park, NY and we'll be glad to assist you. Note this item can be customized and upgraded to $299.95. Item code VFRRWB32.